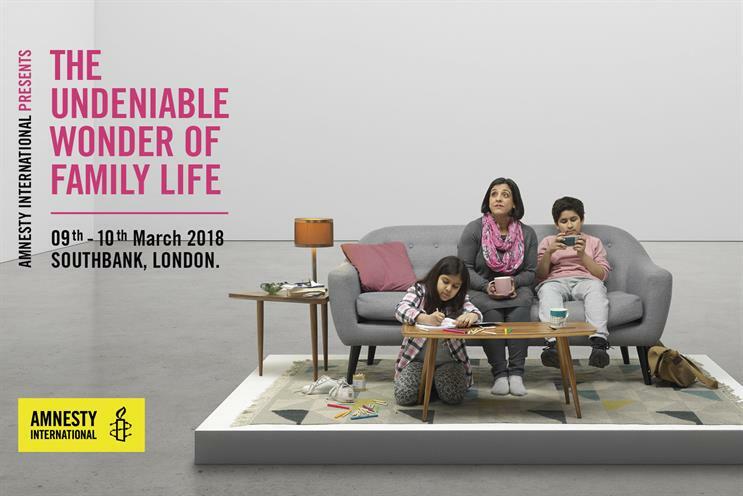 Amnesty International UK, the human rights organisation, is showcasing family life to highlight the importance of reuniting refugee families with a "living installation". "The undeniable wonder of family life," created by VCCP, takes place before Mother’s Day this weekend and invites families to spend time in a large Perspex box on London’s Southbank. The idea behind the work is to show the joys of everyday family life – be it playing games, sharing a takeaway or watching TV – but not everyone is as lucky. It is part of the "Families together" campaign, in partnership with Refugee Council, UNHCR and Student Action for Refugees, which calls on MPs to attend a parliamentary debate on 16 March to vote for reuniting refugee families as part of the Refugee Family Reunion Bill. The installation will be live streamed on Facebook, and is being supported by social and out-of-home ads. It will be near the Oxo Tower on 9 and 10 March.